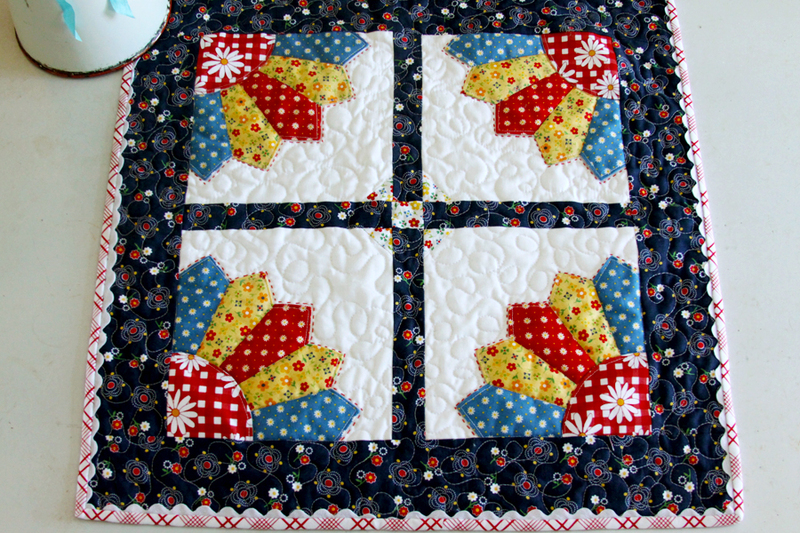 I can’t resist making up cute little mini quilts! 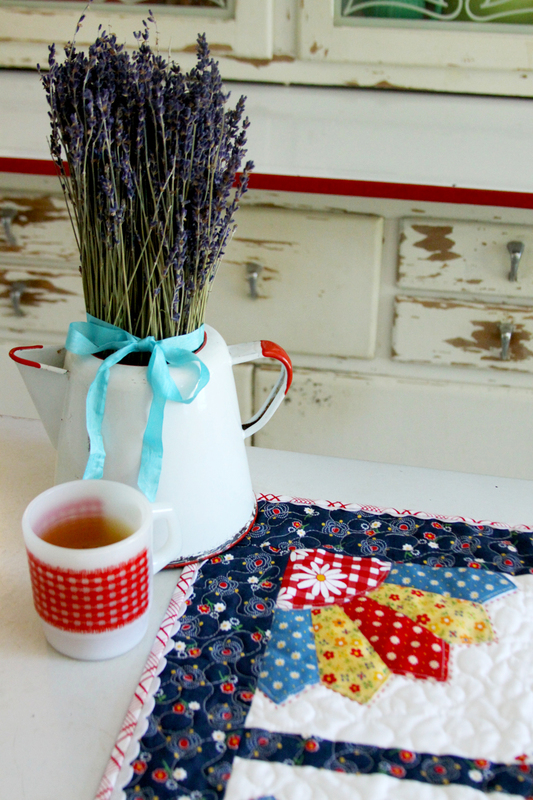 This new Gingham Girls Dresden Mini Quilt is so fun and looks so cute on my little enamel kitchen table! I created this fun new Dresden Windows pattern for this mini – I think the little quarter dresdens are so perfect with the little prints in this Gingham Girls fabric. The colors are perfect for summer too, don’t you think? I have a free tutorial for this mini today too! Click here for the Quarter Dresden Pattern. 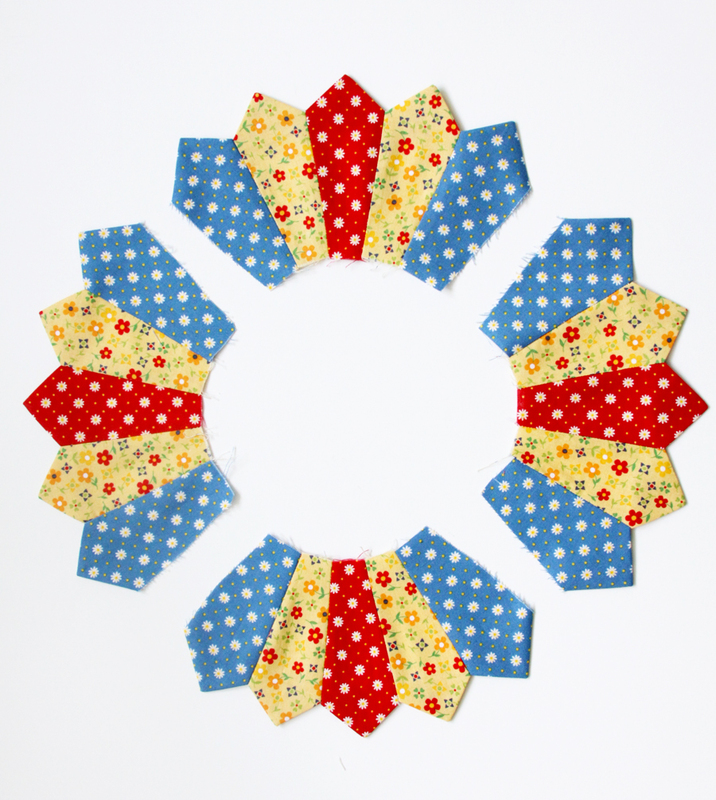 Print out your pattern and cut out 4 of the quarter circles and 5 blades for each dresden. To sew your dresdens together, place the wide points of the fan right sides together and sew across the top with a 1/4″ seam allowance. Press the seam open and use a tool to make sure you have a nice sharp point. Sew the sides of each of the dresdens together to form 5 blade sets. You’ll need four of these. 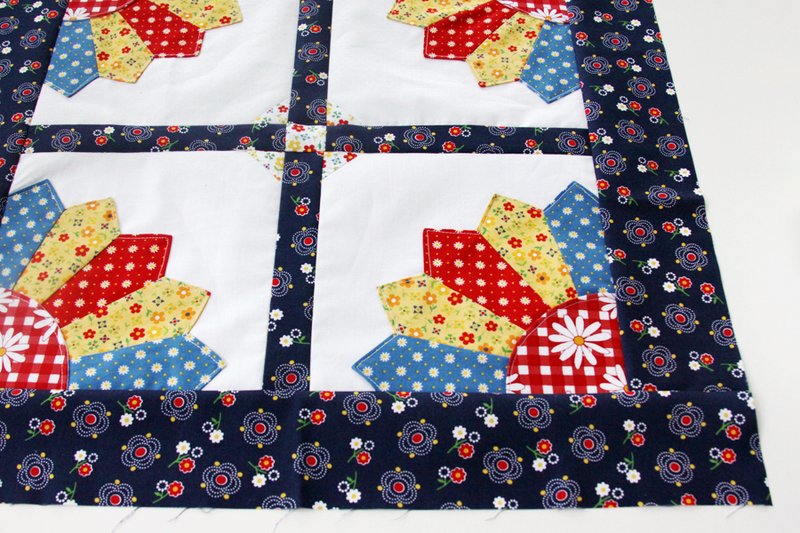 Place the fusible side of the interfacing towards the right side of the quarter circle. Sew the interfacing to the fabric along the curve, then trim the seam. Finger press the quarter circle right side out. 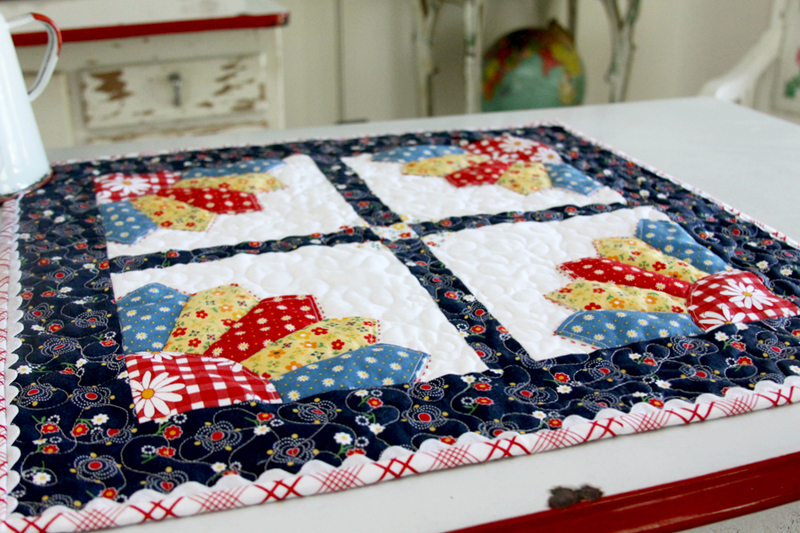 Place the dresdens on the 7 1/2″ square of white fabric so the outside edges of the fan line up with the sides. Place the quarter round circle on top of this with the interfacing side down and iron in place. Sew down the dresdens to the white fabric by sewing just inside the pointed edges and inside the curve of the center piece. 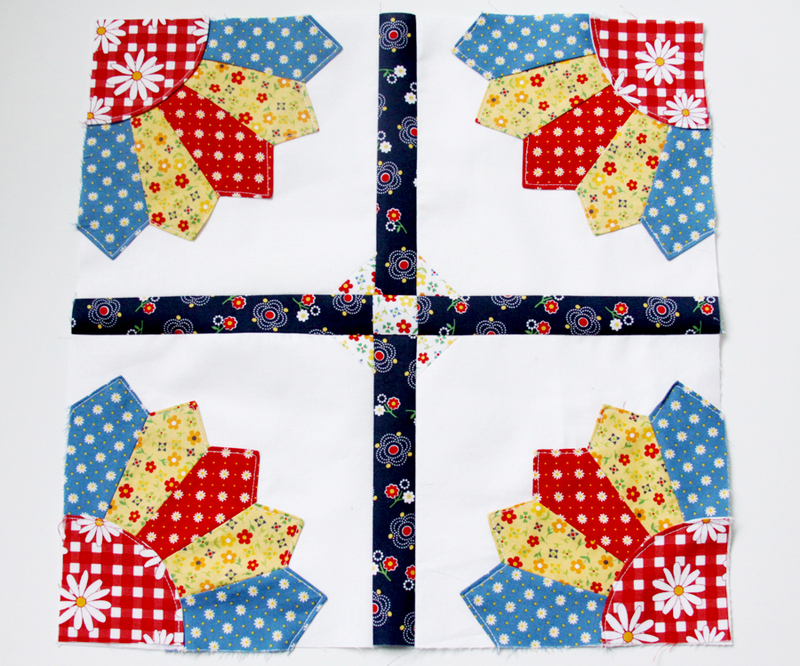 Place one of the 1″ squares right sides together on the corner of the white square opposite the dresden. 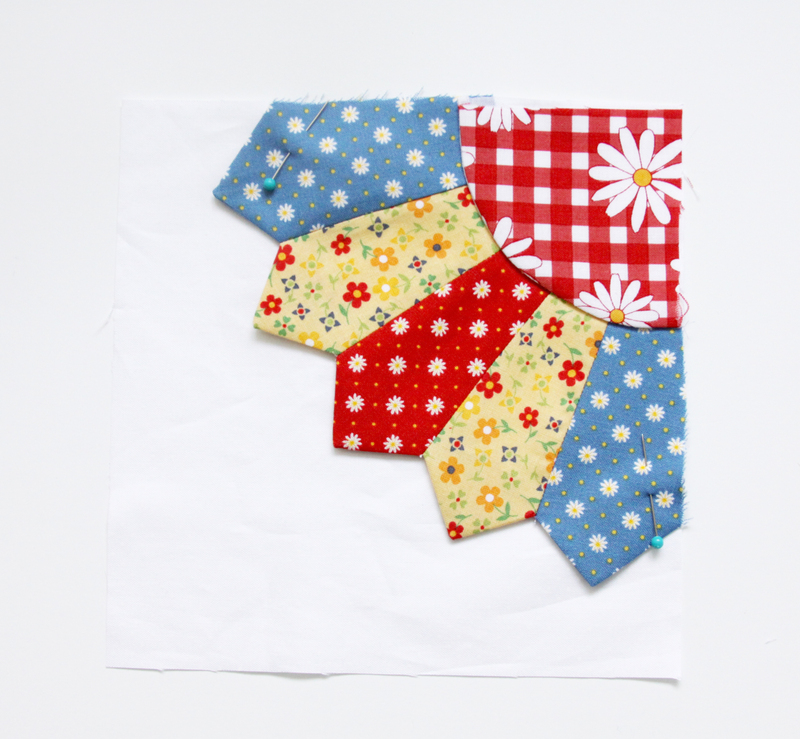 Sew diagonally across the 1″ square and trim the seam. Press the print square away from the white fabric as pictured. 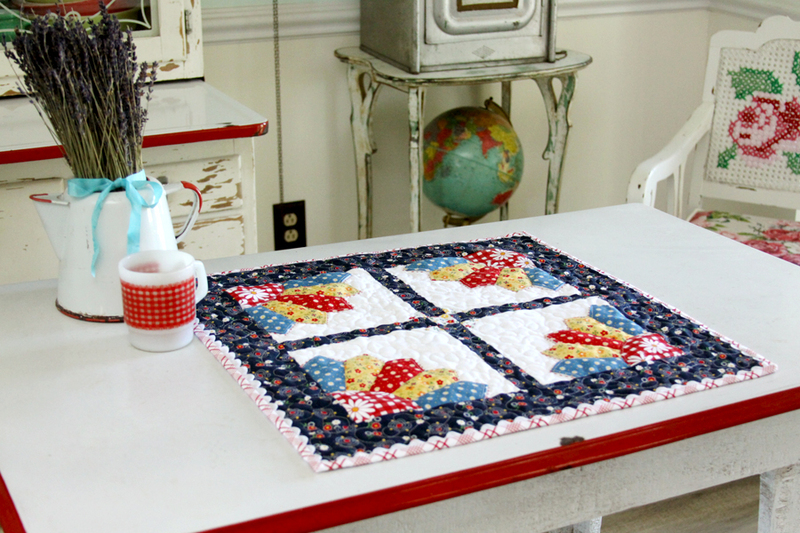 Sew together two sets of dresden windows with a piece of 1″ sashing between them. Make sure you have the dresdens aligned correctly. 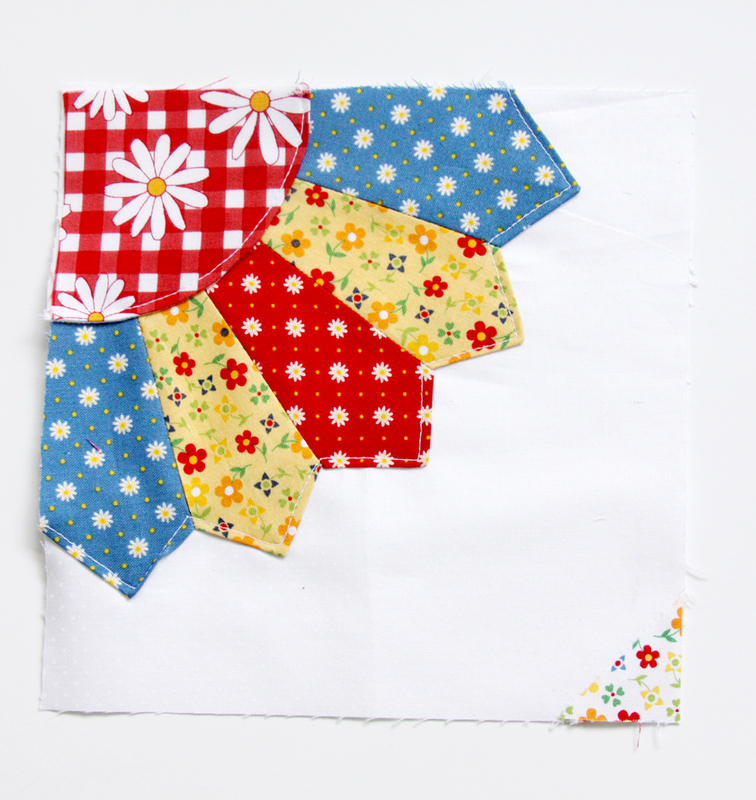 Sew two more sashing pieces together with a 1″ square print piece between them along the short sides. Sew the top section to the middle sashing and the middle sashing to the bottom section. Press the seams away from the white fabrics. 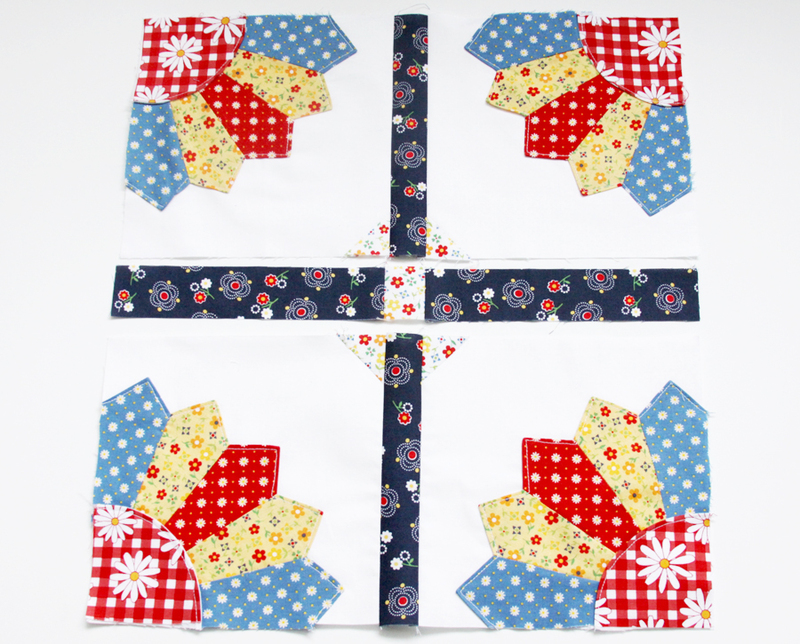 Sew a 3″ sashing piece to the top and bottom of the square. Trim the ends to meet the main section. Press the seams away from the white. Sew the remaining two sashing pieces to the left and right sides. Press. 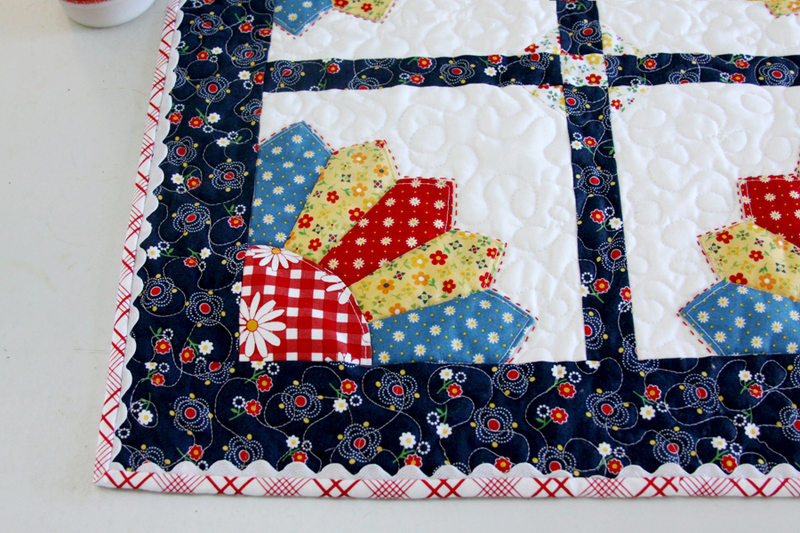 Layer the quilt together with the backing, batting and top. Pin everything and quilt. I used a meandering stitch everywhere but on the dresdens. For the dresdens I stitched between each dresden fan and around the curved edge seam. Add a bit of decorative embroidery by outlining all the dresdens with a running stitch using DMC floss or pearl cotton. Trim the batting and batting. 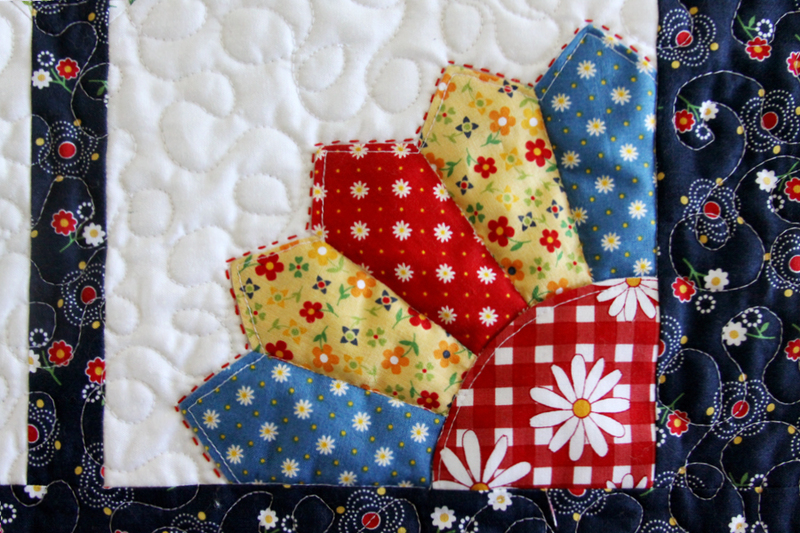 Sew rick rack around the edge so once side of the curves lines up with the edge of the quilt. Sew your binding in place as desired. I used 2 1/4″ binding for this mini – I wanted that cute plaid to show around the edges! 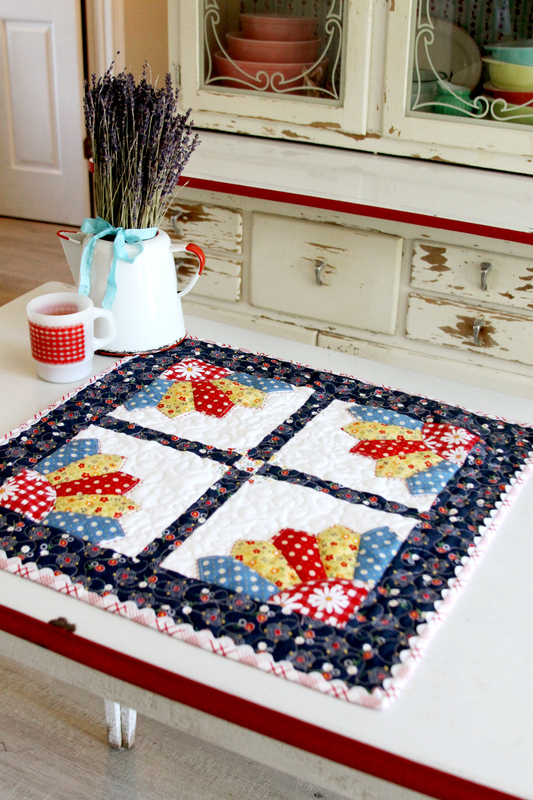 Now you can use your cute Mini for a table topper or as a wall hanging! 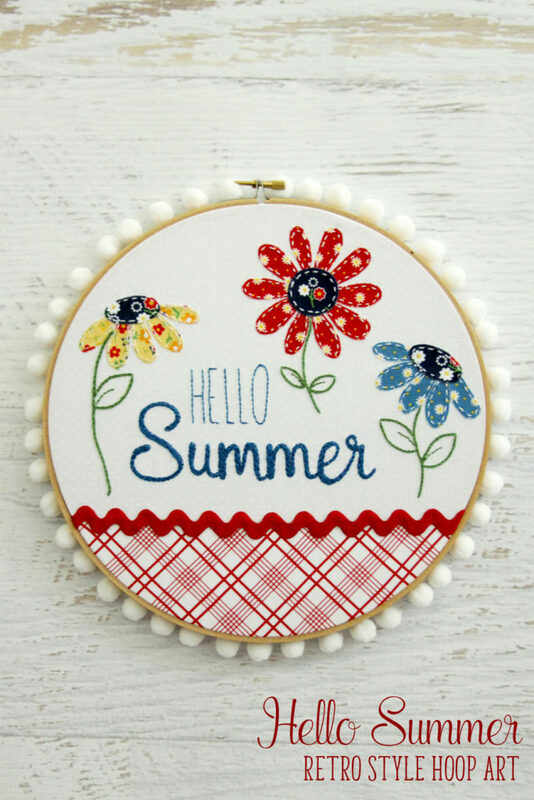 I also made up this fun Hello Summer Hoop with Gingham Girls fabric – I love how it turned out! 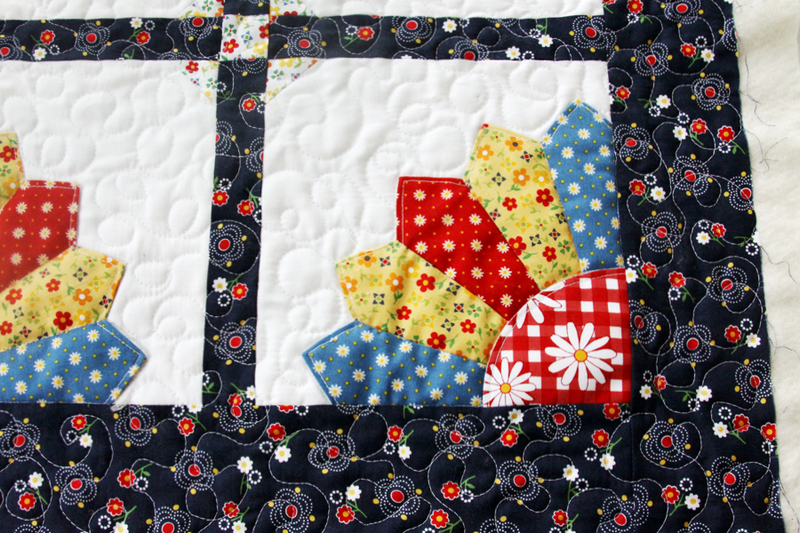 The mini-quilt and the hoop are so cute. 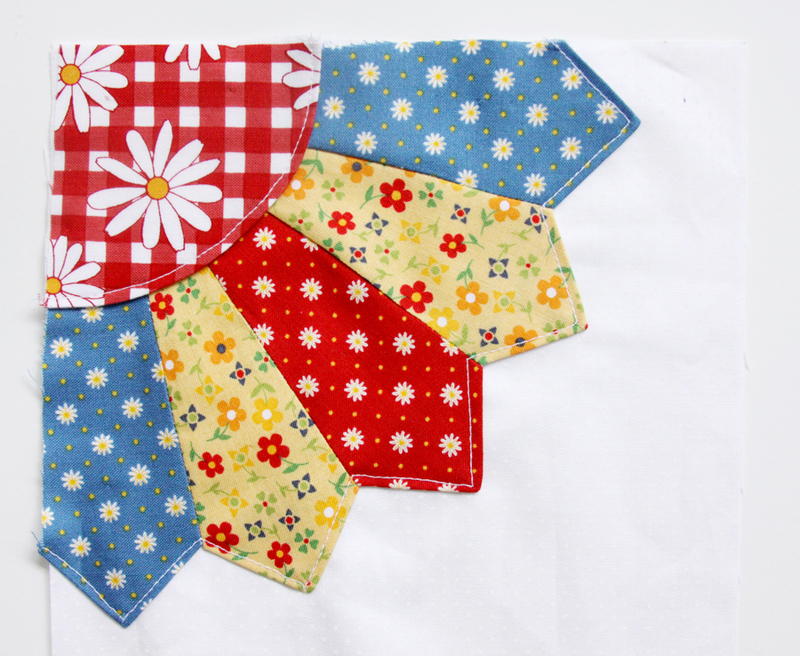 I think I would like to use your dresden quarters to make placemats also. 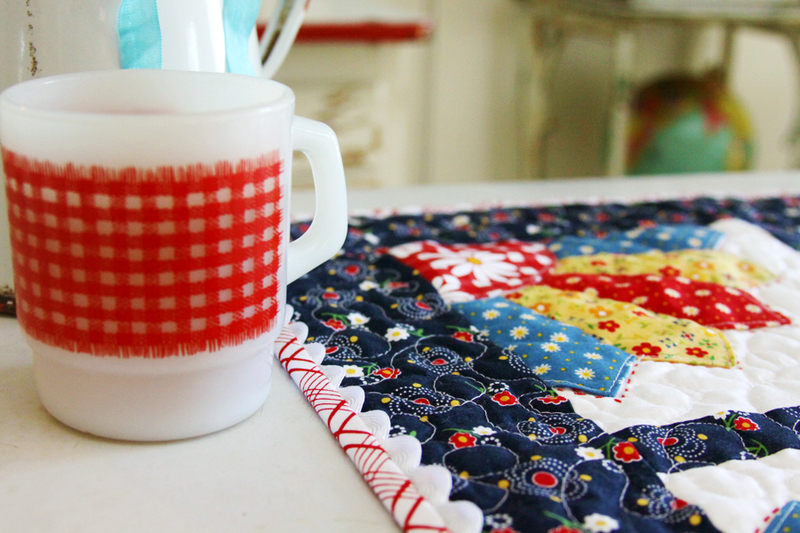 The mini dresden quilt would look perfect on my daughters enamel table. It has blue trim and blue gingham design on the top…I noticed yours is red. Since I will be visiting her this summer (she is having twins) this will be perfect. Did you read my mind? Thanks for the patterns. So cute, making one this weekend! What an absolutely darling combo! Perfect for summer decorating and July 4th! Thanks so much for the patterns too.. I LOVE this! So very, very cute. And the fabric you used for the binding along with the ric rac is perfect! I want to make one very soon. Thanks for sharing. Que belleza de mini quilt, precioso, soy muy amante al plato desdren, muchas gracias, en este momento es tarde en mi pais, pero dejare mis telas escojidas y en la mañana solo pensare en ello, de nuevo gracias. Beautiful! The fabrics are lovely and look great together. This is so charming. 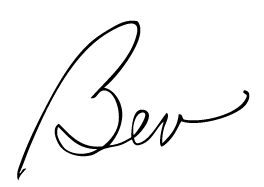 Can you give measurements for the template for proper printing? Is there a standard size blade for certain block sizes? I’m trying to make a 5 blade, rounded petal, fan for a 12″ block. Thanks! 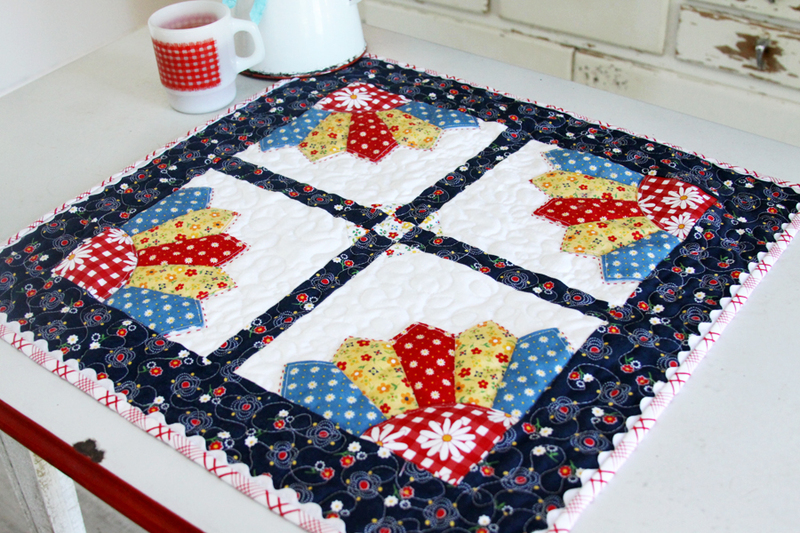 I love the colors on this mini quilt! Pretty!